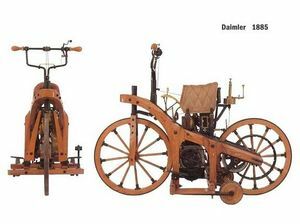 Diamler began under German engineer Gottlieb Daimler who is often credited with building the world's first motorcycle(earlier steam powered bikes had came before him), the wooden framed Einspur was first ridden by his son Paul in 1885. Daimler simply built Einspur as a test platform for his engine, and shortly afterwards began to focus on automobile production for which he is still famous for. This page was last edited on 3 March 2009, at 12:56.